Steve Bannon’s appreciation for the Bhagavad Gita makes more sense than you might think. The Hindu scriptures, especially the Bhagavad Gita, have fascinated many public figures in the West for the last two centuries. Aldous Huxley had the Gita in mind when he wrote Brave New World. Heinrich Himmler saw himself as a disciple of its teachings. And Robert Oppenheimer famously quoted the scripture when the first nuclear device was tested at Los Alamos: “Now I am become Death, the destroyer of worlds.” (Bhagavad Gita 11.32). The Bhagavad Gita is a dialogue from the mouth of god incarnate in human form as Krishna to the warrior Arjuna on a battlefield, exhorting him to remember the higher duty of establishing dharma in the world over all else. 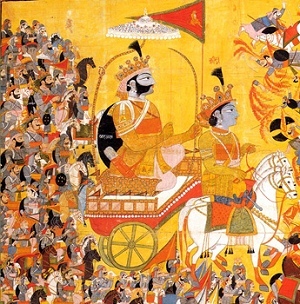 The concept of dharma and the teachings of the Gita continue to influence prominent figures in the West, including Stephen Kevin “Steve” Bannon, the chief strategist for U.S. President Donald Trump. This is despite the fact that Bannon has spoken of the power of Judeo-Christian norms in underpinning the capitalism that led to the greatness of the West. Throughout Hindu scriptures and epics, individuals are portrayed as either fighting for and upholding dharma, both through self-actualization and actual sociopolitical or military action, or going against it. Nonetheless, as a character from the Hindu epic the Mahabharata points out, “Dharma is subtle.” It is situational, and difficult for any one individual to say what exactly their or anyone else’s dharma is exactly. Given Bannon’s worldview, which sees the world, and especially the West as being in a state of moral and economic crisis resulting from the lack of mooring in traditional values (in other words, adharma, or lack of dharma or alignment with a sacred worldview), his interest in dharma is not surprising. Whenever and wherever there is a decline in dharma….and a predominant rise of irreligion — at that time I descend Myself, to deliver the pious and to annihilate the miscreants, as well as to reestablish the principles of religion, I Myself appear, millennium after millennium. (Bhagavad Gita 4.7-4.8). This apocalyptic worldview is frequently found in Bannon’s thought. Ordinary conflicts are thus parts of and transcended by issues far greater than the mundane. Who is banned or who is appointed to the U.S. Supreme Court is irrelevant, or not all that important, in the larger scheme of things, which is to push the world toward the war for dharma. In the Mahabharata, the Pandavas, the group of cousins who were wronged, sought to avoid war for years in order to spare the lives of millions, but were eventually convinced that they must go to war, not for themselves or their stolen kingdom, but for the stake of dharma itself. These warriors arrayed in lines, opposing your men, even without you, will have perished! Arise, therefore, and seize upon your glory! With your foe conquered, enjoy thriving kingship! I have destroyed your enemy already: serve as my tool, O ambidextrous archer! (11.32-11.33). Bannon seems to have a worldview in accordance with some of the teachings of the Gita that see the world as a cosmic battlefield, possibly imaging himself as warrior of dharma, adapted around his idea that the defense of capitalism and Christianity should be militarized and seen in the context of a great clash of civilizations and ideas. But like dharma, the Bhagavad Gita is also more complex and subtle than merely being the blueprint for warfare waged for the establishment of dharma. It also preaches wisdom, restraint, nonviolence in many cases, and the thoughtfulness that comes from deep meditation. And it says that the wise do not see any difference between different types of beings, whether the high or the low (5.18).